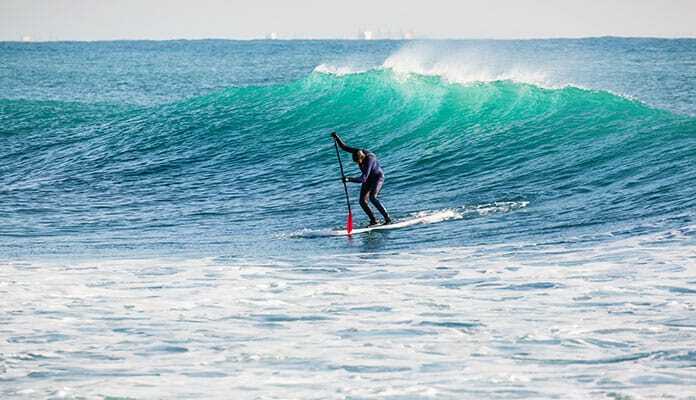 SUP surfing has grown in popularity worldwide. Many paddleboard enthusiasts are pushing the limits of their boards with SUP yoga, SUP fishing, and even surfing. If you are a surfer or a skateboarder, you may think catching a wave on a SUP is easy. 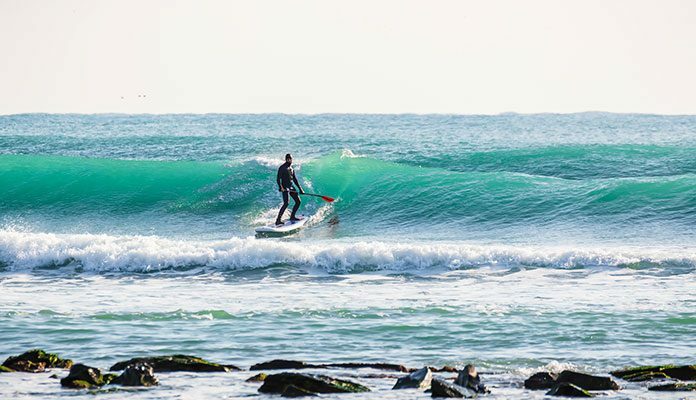 Transitioning this sport to a SUP isn’t as seamless as you may think and there are some key things you need to know before hitting the beach. First off, remember to be patient and get ready to have some embarrassing tumbles as you learn to master this sport. If you are new to paddle boarding, be sure to read our guide about how to get comfortable on your board. Armed with a bit of knowledge you will be able to paddle through your wave and have a great time SUP surfing. We have all your insider tips below. Before SUP surfing it is important to ensure that you have the right type of board. Longer boards intended for racing and touring will not be compatible with surfing. Inflatable boards are also not ideal for surfing and will be much harder to use. Pay close attention to the bottom of your of your SUP. You will want a board with a curve to the bottom, called a rocker. This curve will add some flex to your board so that you don’t nosedive into every wave. When looking for a SUP surfboard you will want to look at boards that will be buoyant enough. Boards within the 8-10 foot range are ideal for this. To ensure you have enough stability try opting for a board with a diameter of about 30 inches and a total volume measuring between 140 – 200 liters. 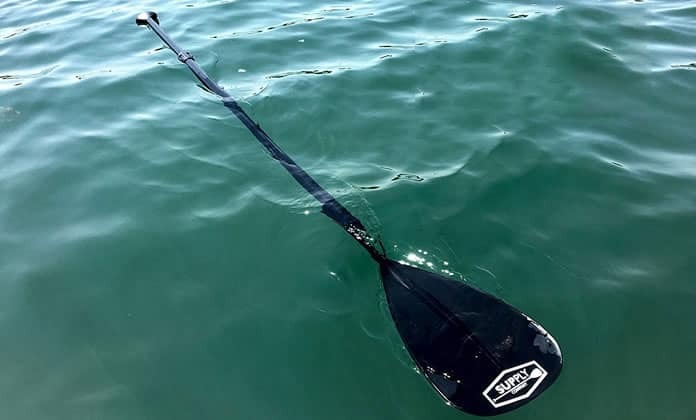 Before jumping into purchasing your first SUP it is a wise decision to rent a few different kinds so that you can get a good feel for what features work best for you. Be sure to always wear a leash while surfing. You can expect to tumble into the water quite a few times and don’t want to lose your board. It takes some preparation to start paddling into the wave. If you are just learning we strongly suggest heading to a beach that isn’t going to be overly crowded. This will give you the chance to fall and learn without feeling pressured by other riders. Take a few minutes to see where the wave breaks. This will let you know when to end your run and give you some information about hazards you should avoid. There are many ways to paddle out to the waves. You can kneel, stand and even lay flat and paddle with your arms. If you’re feeling it you can stand like you would on a choppy water day. To give yourself added stabilityhave a stance where you put most of your weight at the rear of the board when you reach the whitewash. Pro Tip: Don’t let your paddle get away from you. Most float, but will find its way to the shore faster than you can swim after it. This can slow your day down and use your energy fast. Now you’re ready to ride a wave. You’ll find that this is easier on your paddleboard than even with a surfboard – once you get the hang of it. Pick waves that you feel comfortable with. Don’t try the biggest ones right away. One of the perks of SUP surfing is that you can see the waves more than sitting on a surfboard. Pro Tip: When charging a wave, time it so that you don’t have to rush. Staying calm will give you the time to get to the wave without tipping. You’ll have to turn your board so you’re facing the shore. This is one of the more difficult maneuvers when SUP surfing. A move called the pivot will make your life much easier. To do this correctly you will want to move to the back of your board so your weight makes the front of the board come out of the water. This is the tricky part: paddle the opposite way you want to turn. At this point, you should be parallel to the shore as you paddle hard into the wave. Don’t start turning towards the shore until you are almost inside the wave. If you paddle facing the shore you will end up facing the wrong way and waste the wave. This may be the most important part of SUP surfing. Instead, wait for the wave to catch up to you and then turn into it when it’s caught up. It may seem counterintuitive but will yield better results. When the wave catches you, it may be best to turn your feet into a more aggressive stance so you gain some stability. Catching the wave is the hard part. Once you have done that it’s all downhill from there. Once you are actually up and riding the wave you will find it is much the same as regular surfing. You will hardly notice the large size of your board. If you are an experienced surfer you will have an easier time as your instincts for the sport begin to kick in. Pro Tip: Remember that this is supposed to be fun. You will take a few falls, but every time you inch closer to riding the perfect wave. Think of your paddle as an added accessory rather than a hindrance. Having a paddle can help you make tighter turns. Simply dig your paddle into the water and turn sharply. The paddle can also make it so that you have added balance and stability in the water. Be sure to try using your paddle to help you get into an ideal position where you are riding the nicest part of the wave. You will know when to exit when the wave starts to turn to whitewash. There are many ways you can exit the wave from dropping to your knees to riding it out. Surfing on a SUP can be incredibly fun and rewarding. It will help you develop your skills as you are working with a much larger board. With some time and a lot of practice, you will soon fall in love with his sport. Be prepared to fall quite a bit in the beginning as you are getting used to riding a completely different kind of board. In time you will develop new techniques that will have you surfing like a pro. With the help of all of our tips above, you will have a much easier time perfecting this sport. If you stick with it you will find yourself surfing in no time. In the end, remember first and foremost to have fun. Be sure to always wear sunscreen when out on the water as the sun’s reflection from the water can be harsh. Paddleboarding can be a really good workout. Using every part of your body you can expect to burn a ton of calories all while having fun and being outdoors. Talk about a win-win! If you liked this article be sure to read about some of the biggest waves ever surfed. While you may not be able to handle this big of waves on a SUP you can definitely dream. Have you ever tried SUP surfing? Tell us about your experiences in the comment section below.